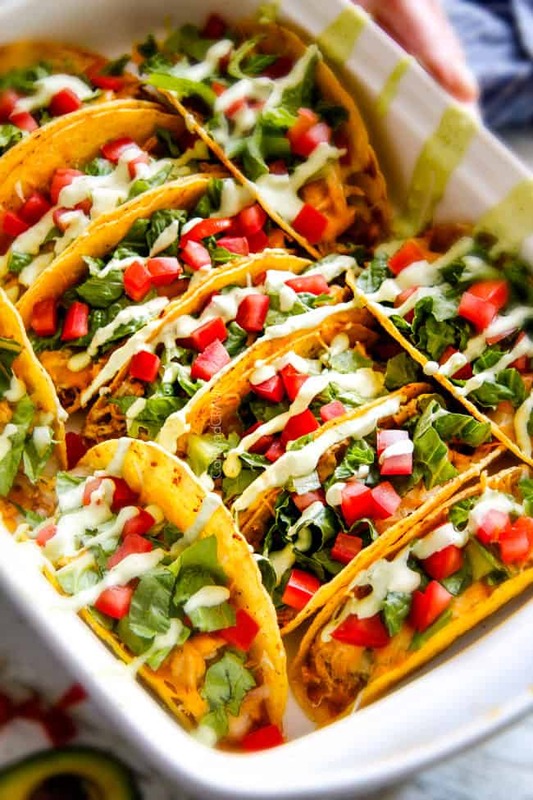 EASY Baked Fiesta Ranch Chicken Tacos piled with refried beans, fiestalicious Slow Cooker Mexican Cream Cheese Chicken, lettuce, tomatoes, and Tomatillo Avocado Ranch is a heavenly symphony of flavors and textures in every bite! Your family will love these crunchy baked chicken tacos and YOU will love how easy the dump and run Ranch Cream Cheese Chicken makes this chicken taco recipe! 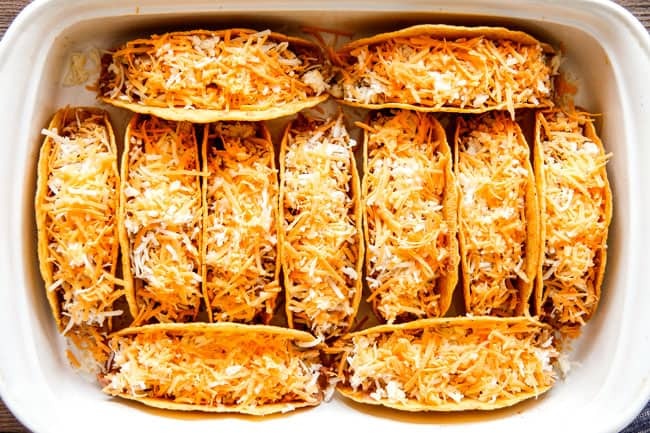 Did you grow up on Baked Tacos in the crispy shell? The ground beef variety were a staple at our house along with Chicken Divan, Sloppy Joes and Whipped Potatoes with Sauce. 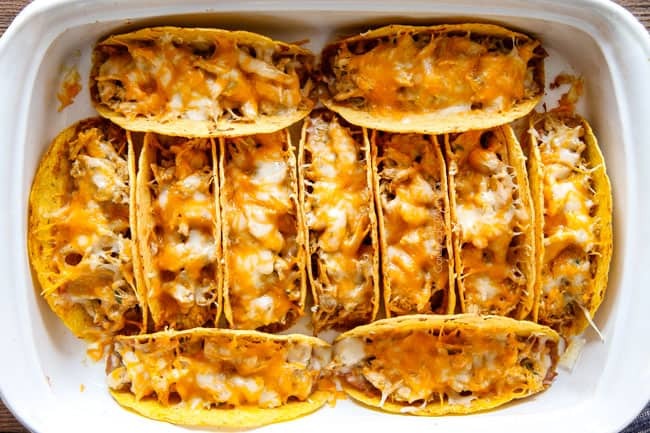 My mom always kept a few packages of hard shells on hand for quick, easy dinners – the kind that come together so quickly you actually feel somewhat guilty but should just feel smart instead because everyone loooooooves Baked Tacos night! 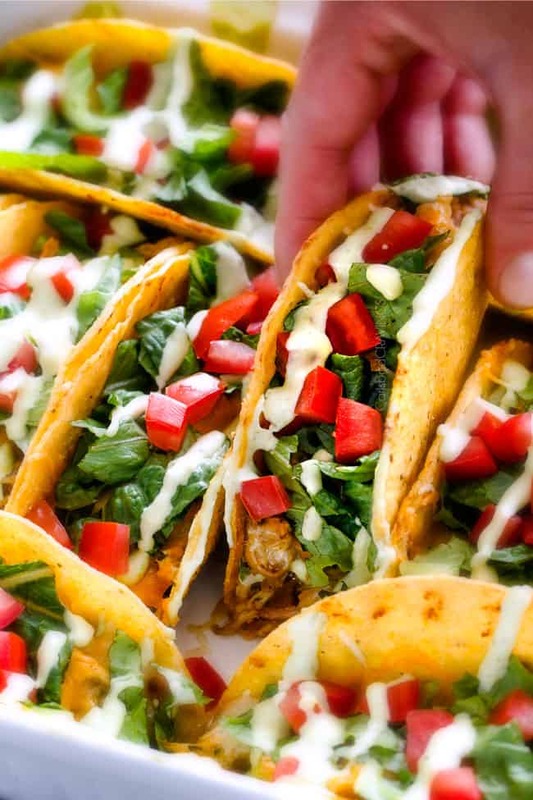 These Baked Tacos could be stuffed with all sorts of meat fillings from my Mexican Chicken to Salsa Verde Honey Lime Chicken to Carnitas, to Sweet Chipotle Pork and even my Burrito Filling would actually be crazy good, but for these tacos, I chose my AH-mazing Slow Cooker Fiesta Ranch Cream Cheese Chicken! Its creamy, packed with spices and the tang of ranch. Think Mexican Ranch Chicken and think DE-licicous! 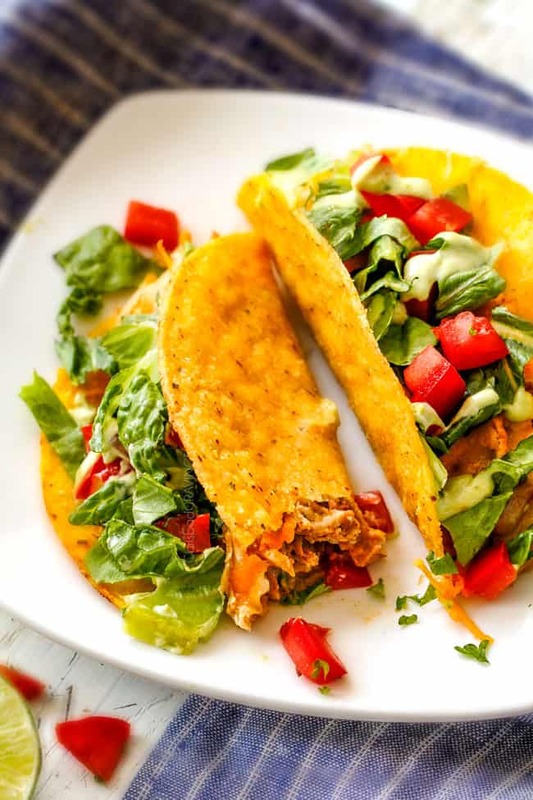 To make these easy baked chicken tacos, you first make your Fiesta Ranch Chicken in the slow cooker which only requires adding ingredients and stirring – sooooo easy. 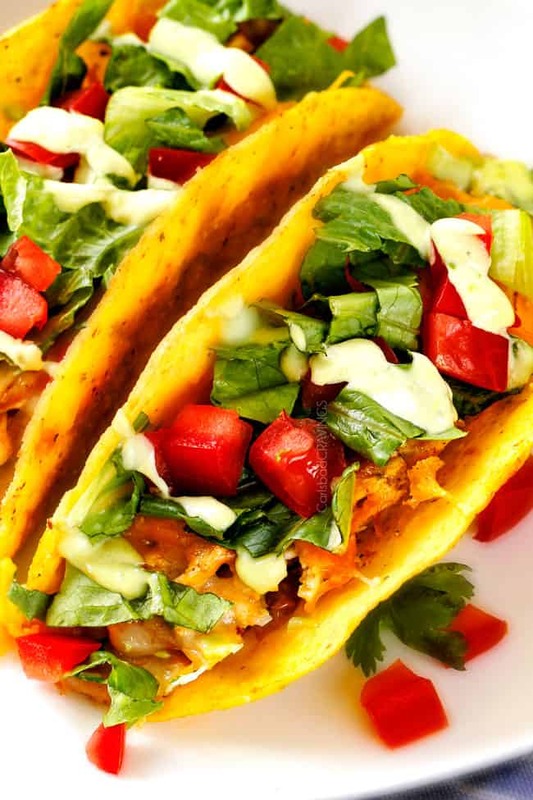 You could even make this chicken a day/days ahead of time and keep it on hand for when you are ready to make these tacos – just reheat before assembling. While your Tacos are baking you can whip of some Mexican Rice and your whole family will be singing your praises. 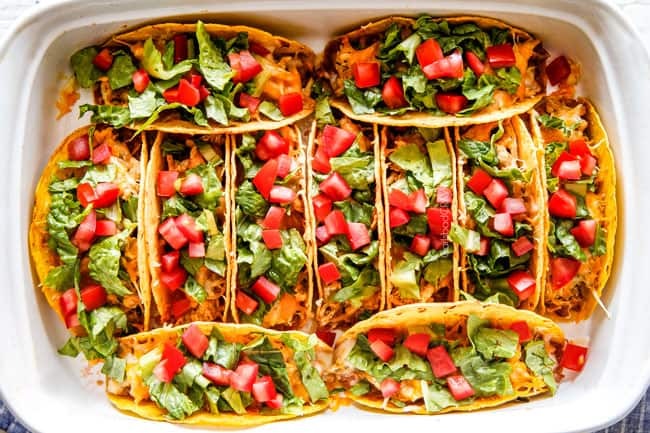 To make, line up your taco shells in a 9×13 casserole dish – I use the Stand N’Stuff Taco Shells which are super convenient and such an improvement over the traditional ones that I always tried to keep upright as a kid. Layer your shells with creamy refried beans…. And marry it all together with something creamy, either sour cream, ranch or I like to use my reader’s favorite (and mine!) 5 Minute Blender Tomatillo Avocado Ranch and if you are feeling extra gourmet, top it all off with my Homemade Salsa or Pico de Gallo ! You won’t be sorry. This Tomatillo Avocado Ranch makes absolutely everything better. 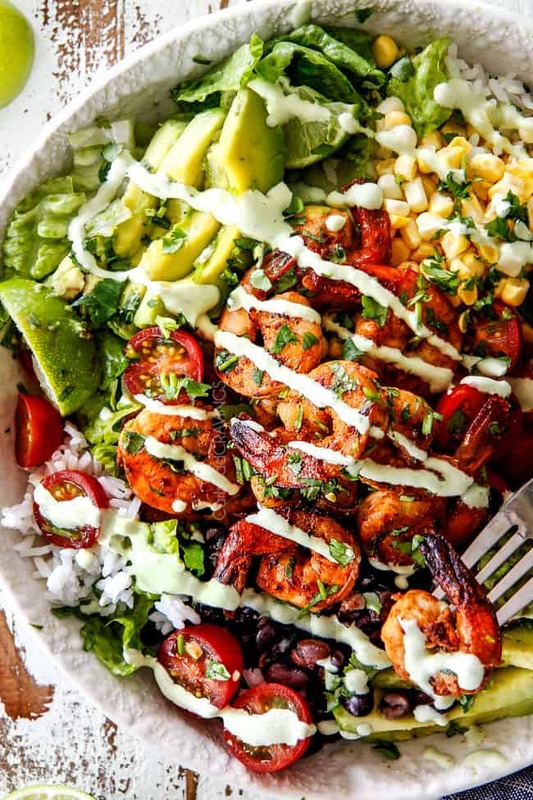 It tastes like creamy, velvety avocado ranch with a Mexican fiesta flair added by the avocado, tomatillo, jalapeno, garlic, cilantro, lime and smoked paprika. Layers of herbs, layers of spice, layers of luscious goodness that just make these Fiesta Ranch Chicken Tacos that much more obsessive worthy. 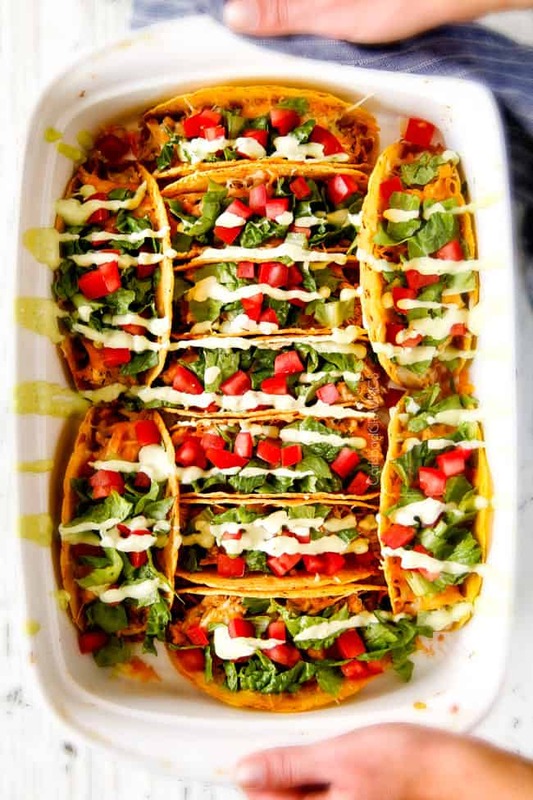 Want to try these Baked Fiesta Ranch Chicken Tacos? Pin them to your MEXICAN, CHICKEN or DINNER Board to SAVE for later! 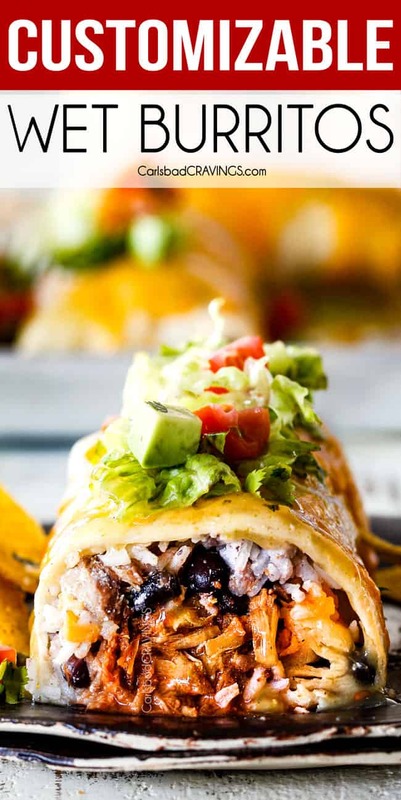 EASY Baked Fiesta Ranch Chicken Tacos piled with refried beans, fiestalicious Slow Cooker Mexican Cream Cheese Chicken, lettuce, tomatoes, and Tomatillo Avocado Ranch is a heavenly symphony of flavors and textures in every bite! The dump and run chicken is made in advance making assembly a snap! Prepare Slow Cooker Fiesta Ranch Cream Cheese Chicken according to directions. (optional) Meanwhile prepare Tomatillo Ranch according to directions. Refrigerate until ready to use. Preheat oven to oven to 350 degrees F. Line a 9x13 baking dish with standing taco shells. 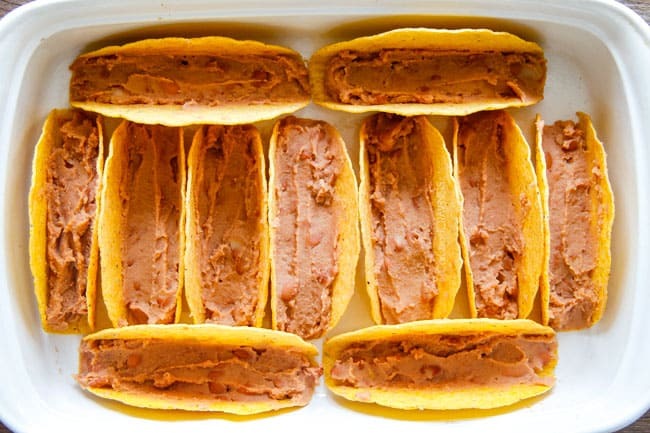 Spread 2 tablespoons refried beans on the bottom of each taco shell. Top beans with chicken and a generous amount of cheese. Bake at 350 degrees F for 15 minutes or until cheese is completely melted. 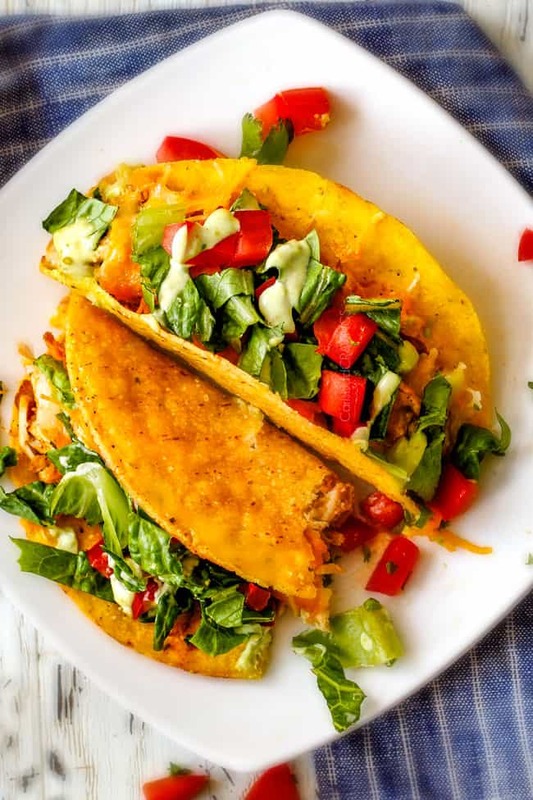 Top cheesy tacos with lettuce and other desired toppings and highly recommended Tomatillo Avocado Ranch or, if not using, top with sour cream or traditional ranch. 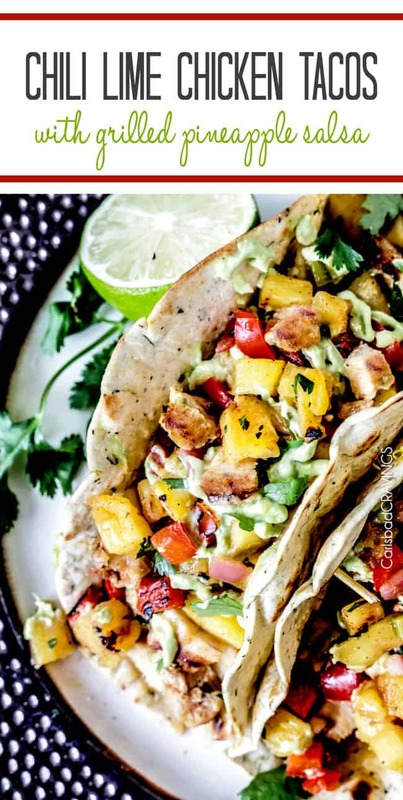 *You will not use all of the dressing on the tacos, but I still recommend making the whole recipe because you will want to use it on everything! Jen, love your recipes! Do you use bone in, skin on chicken breasts in the slow cooker? Can’t wait to try this. My family loves baked tacos! I always make the chicken in my slow cooker too! Love it! I need to try your Fiesta Ranch recipe! 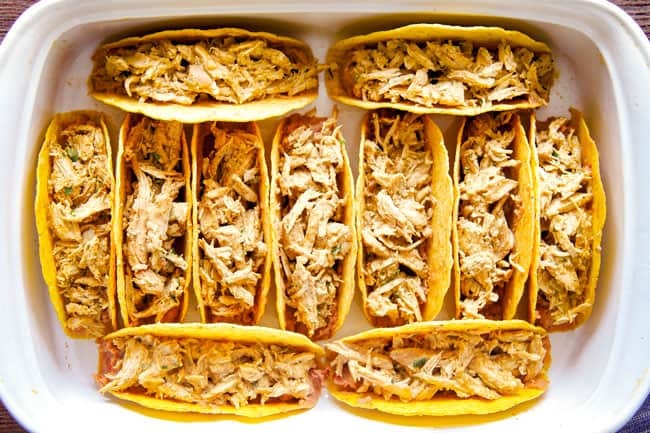 Baked tacos are the best and I agree slow cooking chicken is the way to go! I hope you like this version! LOL! The creative process in recipe development is one of my favorites! I am so honored/flattered that you love the Mac and Cheese so much after all the recipes you’ve put to the test! It is definitely one of my favs as well 🙂 That is so awesome you have also made all of my Mexican recipes, I am excited for you to add this one to the list! Thanks so much Teri, you are the best! Right?! It had been forever since I had hard taco shells too – but now that they are back on my radar – so many possibilities!!! HI Jen, It’s Jen … Belnap, from church. I’m making this meal tonight, and I cannot wait to see how it turns out. I’ve had so much fun reading lots of your posts on this site. Hopefully I will see you in the hallways at church (I’m still in primary) soon! Hi Jen, it is so nice to hear from you! That is awesome you discovered my site and made this recipe last night – I hope it was a winner with the whole fam! Let’s get together soon! Are these good leftover or would it be better to only make what I plan on eating at that time? Hi Leanne! I think they reheat well. Like all leftovers, they lose a little moisture so you may want to stir in a splash of milk when reheating but I would recommend it!